SLAVYANSK, Ukraine -- Ukraine has alleged that Russian forces are operating in the east. But one man tells TIME that they do not work for the Russian government. Alexander Mozhaev, a pro-Russian separatist whose photograph has appeared in numerous publications in recent days and who says he is not employed by the Russian state, stands with fellow separatists in the town of Slavyansk on April 20. Spend a few days riding around the separatist badlands of eastern Ukraine, and you’d have a good chance of running into Alexander Mozhaev, the fighter suspected of being a Russian government operative. He’s hard to miss, and not just because photographs of him — or claiming to be of him — have been made available by the Ukrainian government in recent days. His beard, which juts out of his face like a spade, has made him something of a mascot for the local separatists. Perhaps aptly, Mozhaev’s nickname among them is Babay, the Russian word for bogeyman, which is exactly what the Ukrainian government has tried to make him. Over the past week, authorities in Kiev have released photographs that purport to prove that Mozhaev is an agent of the Russian military intelligence service known as GRU, and they have shared that information with senior Western diplomats and some reporters. This claim has been at the center of their narrative that Russian special forces, controlled by the Kremlin, have taken over towns in the Donbass, the industrial heartland of eastern Ukraine. But Mozhaev, a mild-mannered fighter with a chest like a barrel, says he only wishes that were true, and so do many of the people in the separatist-controlled towns that dot this region. If Russian forces had indeed taken over eastern Ukraine, as they did in Crimea last month, the streets of the separatist stronghold of Slavyansk would probably not be nearly as lawless as they have become in recent days. On the ground, the conflict in this town of 120,000 feels far more erratic and dangerous than the Russian occupation of Crimea, where a sense of order largely prevailed, in part because of the presence of disciplined and professional Russian troops. 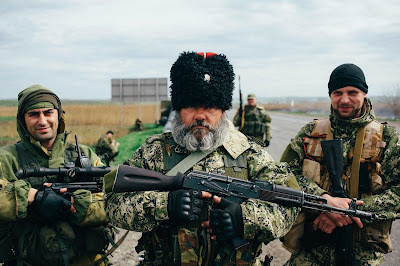 The ranks of the so-called “green men” who are running Slavyansk, in contrast to those troops, appear to be made up mostly of war veterans, itinerant pro-Russian nationalists and ethnic Cossacks from across the former Soviet Union. Fitting neatly into all these categories is Mozhaev, a Russian citizen, whose fellow fighters are now armed not only with assault rifles and rocket-propelled grenades, but also tanks and armored vehicles that they have seized from the Ukrainian army. Mozhaev and his comrades took control of Slavyansk about a week ago. But over the past few days there has been no evident sign that they are receiving material support from Russia. Their foot soldiers have been so short on fuel that they have asked journalists to bring them gasoline in exchange for granting interviews, saying they don’t have enough fuel to go on patrols. Their leader, Vyacheslav Ponomaryov, a soap manufacturer who took the title of “people’s mayor” after seizing power, has pleaded for assistance from Russian President Vladimir Putin, but has apparently been ignored. “We need guns, you understand? We’re running out of everything but spirit,” he tells TIME. His militia force, he admits, is made up partly of volunteers who have come from Russia, Belarus, Kazakhstan and other parts of the former Soviet Union. But Kiev’s cries of a separatist insurgency fueled with money, weapons and troops from the Russian government look out of sync with the reality in Slavyansk. No one embodies that disconnect quite like Mozhaev. In trying to link him to Russia’s GRU special forces, the government in Kiev has offered two blurry photos as evidence. One of them, allegedly taken during the Russian invasion of Georgia in 2008, shows a bearded man wearing the GRU insignia — a black bat with its wings spanning the globe — on the shoulder of his uniform. The second photo, taken this year in eastern Ukraine, shows Mozhaev dressed in camouflage among his fellow separatists. Kiev says the two photos are of the same man. Mozhaev finds that slightly flattering but altogether false. When TIME tracked him down on Monday night, Mozhaev and his men had just finished taking over the local headquarters of the Security Service of Ukraine, or SBU, in the town of Kramatorsk, a short drive from their base of operations in Slavyansk. Having met no resistance at the SBU that evening, he and his men were riding around Kramatorsk in a dark green van, which looked like a windowless, Soviet version of an old VW Camper. The vehicle, whose fender had been stenciled with the words People’s Militia of the Donbass, disgorged at least 10 heavily armed passengers in mismatching camouflage uniforms. This was the rapid reaction force of the local separatist militia. Mozhaev is a member of that force. TIME showed him the picture supposedly placing him in Georgia during the 2008 war. His men then gathered around to laugh at the photos of Mozhaev and the man in Georgia, slapping Mozhaev on the back as he learned that he was not only famous, but a famous Russian special-forces agent. “That guy looks more like Osama bin Laden than our Babay,” one of the gunmen remarked. In reality, Mozhaev, 36, fits the description of many of the separatist fighters in the area around Slavyansk, a zone of about 100 km in diameter that all branches of the Ukrainian state, from the police to the tax authorities, have effectively abandoned to the separatists. Though he would have liked to have served in the Russian special forces, he says his service was in the regular Russian army, and it ended in the mid-1990s, when he attained the rank of staff sergeant. His reasons for coming to Ukraine in March had a bit to do with Russian nationalism, but more to do with adventurism, and even more to do with his apparently being a fugitive from Russian law. When he failed to come up with the bribe money for the corrupt officials who he says fabricated the charges, Mozhaev was put on a national wanted list in Russia and went on the run, according to his account, which could not be verified. By coincidence, he says, he was forced to flee arrest on March 7, in the middle of Russia’s invasion of Crimea. He chose Crimea as his destination. As TIME reported last month, thousands of state-sponsored Russian Cossacks were then streaming into Crimea to aid the Russian troops with that invasion. For most of March, Mozhaev says, he was there along with some of the men from his Cossack battalion, the Wolves’ Hundred, helping in the siege of a Ukrainian military base near the city of Bakhchysarai and guarding a local TV tower. In late March, after Russia annexed the Crimean Peninsula, “we were sitting around down there and wondering what to do next,” he says. Eventually he wound up in Slavyansk, where Ponomaryov was glad to welcome him into his separatist militia. As of Monday, Ponomaryov said his forces number around 2,500. That number is impossible to verify. Many of his armed supporters wear civilian clothes and do not appear to be part of any military or organized paramilitary group. Well-armed fighters like Mozhaev make up a small minority of Ponomaryov’s force, perhaps a few hundred men at most, with a fair share of Cossacks among them. Known as “green men” for the camouflage uniforms they wear, these militia members are not as well drilled and equipped as the Russian troops who occupied Crimea last month. If there is a Russian military presence currently in Slavyansk, it has remained or is now out of public view. From the beginning, the head of Ponomaryov’s militia force has been a wiry man who goes by the nickname Romashka, which means Daisy in Russian. Romashka claims to have served in a branch of the Russian military in Chechnya, attaining the rank of captain. Some years ago, he says, he married a Ukrainian woman, took Ukrainian citizenship and moved to eastern Ukraine. These days, Romashka drives around Slavyansk in a police cruiser, having removed the license plates and affixed a separatist flag to the hood. But the statements coming out of Kiev about a Russian military operation in eastern Ukraine have left him a bit perplexed. “My buddies watch TV and then call me to say we have some kind of military conflict going on, with tanks, shooting, the works, like in Chechnya,” he says in an interview at the separatist headquarters in the center of Slavyansk. In recent days, Kiev has intensified its efforts to prove that Russian special forces are operating in eastern Ukraine. Its evidence, according to the New York Times, is built around a series of photographs, including the one of Mozhaev, which the Ukrainian authorities have passed on to the U.S. State Department and the Organization for Security and Cooperation in Europe. It is not clear to what extent those pictures have influenced Western decisionmaking on the crisis in Ukraine, but Jen Psaki, a spokeswoman for the State Department, has said the U.S. and its allies “don’t have a shadow of a doubt about the connection” between what she called “the Russians” and the armed militants in eastern Ukraine. But if that connection exists, it is not as explicit as it was in Crimea. For his part, Mozhaev hopes that help is indeed on its way from Moscow. “Russians don’t leave Russians in the lurch,” he says. The criminal charges against him, however, will keep him from returning to his homeland anytime soon. In May or June, his wife back in Krasnodar is due to give birth to his first son — “a full-blooded Cossack,” he says. But he’s resigned himself to missing that family occasion. This article leaves me perplexed with the question, "can the times' journalists do basic math?" In this article the bearded good ole boy, who is 36 years old states he finished service with the regular Russian army in mid 1990s at the rank of Sargent. Unless the Russian military has been in the habit of excepting 10 year olds, this does not add up.